Among the “Prosperity” talk in the 1929 Nashville, GA newspaper article of the previous post was an obscure reference concerning the Ray City drug store operated by C.O. Terry. Sargon, a patent medicine introduced in the summer of 1929 by the G.F. Willis company of Atlanta, was a wildly popular concoction. G.F. Willis was among the largest promoters of patent medicines and had already made millions from a similar quack formulation known as Tanlac. Through a massive marketing campaign, Sargon was made available only through “Exclusive ” drug store agents. 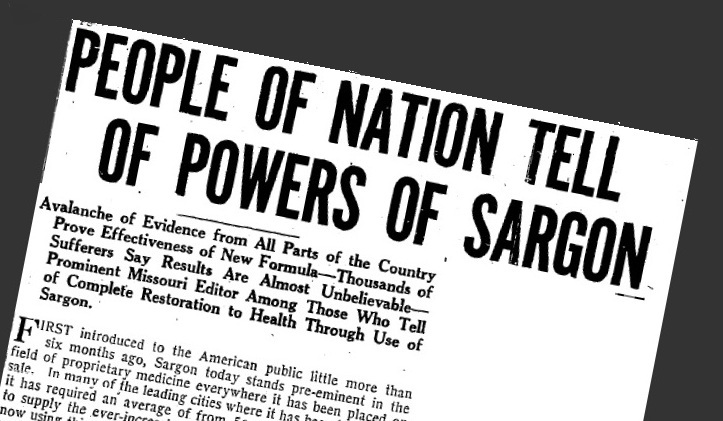 To the readership of 1929, the mere presence of a Sargon distributor in Ray City was evidence of the town’s prosperity. Across the country, the newspapers were full of Sargon advertisements and testimonials. Local citizens who have heard of the amazing results which have been accomplished by Sargon will be interested in the important announcement that this new and scientific formula can now be obtained, in this city. Manufacturers of this revolutionary formula have followed out the policy of selecting outstanding firms as exclusive agents in every city where the new medicine has ‘been introduced. Leading druggists everywhere have acclaimed it as a triumph in the field of modern medicine and have been eager to be among the first to supply it to their trade. Never before in the history of the world has the progress “of Medical Science been so rapid. One important discovery after another has been made which will have a far-reaching effect upon the health and well-being of mankind. Some of these discoveries are startling in the extreme and absolutely disprove many of the beliefs, practices and theories we have known. As scientific investigators learn more and more about the human anatomy, the practice of medicine changes—the old is discarded for the new. As a result of this world-wide medical research, Science has discovered that good health is largely governed and maintained by three vital organs and fluids of the body. These are the liver, the blood and the endocryne glands. What is more important, we have learned that these organs and fluids can be stimulated and invigorated by certain basic elements. Having knowledge of these important discoveries, one of America’s leading bio-chemists succeeded; afterword and one-half years of laboratory research, in combining these basic health-giving remedies of the age. This formula and the formula for Sargon Soft Mass Pills, which are an essential and integral part of the treatment, are the property of the Sargon Laboratories and can be obtained by no other firm or individual in the world. This new scientific treatment, which represents much of our latest knowledge on modern therapy, has been acclaimed by druggists throughout America as a triumph in the’ field of medicine. With the needs of their customers uppermost in their minds, leading druggists everywhere have been eager to be among the first to supply it to their trade. Although introduced in the East since July 9th, Sargon has already become a household word. In Rochester alone, over 16,000 bottles of Sargon and Sargon Soft Mass Pills have been sold and distributed by local firms. Nothing like it has ever been seen before. As a matter of fact, the marvelous success achieved by this remarkable medicine actually staggers the imagination. The demand for Sargon has been positively phenomenal and is probably unprecedented in the history of the drug trade. In the state of California alone, the astonishing total of eight entire carloads was required to supply the tremendous demand during the first sixty days this remarkable medicine was on sale. Six solid carloads were ordered by Texas firms the first ninety days after its introduction in that state. The success of Sargon in Minnesota has been so overwhelming that the Twin Cities, Minneapolis and St. Paul, are selling it at the rate of $200,000 a year through retail channels alone, to say nothing of the immense wholesale distribution: Over 250,000 bottles have been sold and distributed by Kansas City firms—Memphis wholesale and retail dealers have required more than 150,000 bottles—Atlanta retail firms are selling it. at the rate of 566,000 yearly. These are actual figures which can easily be verified and the sales in other sections have been correspondingly large. The ad would go on to disclose that the local drug store had become the exclusive dealer for Sargon, and that large quantities of the product were on the way. Sargon and Sargon Pills.—”Sargon” is a typical alcoholic “patent medicine” put out by G. F. Willis, Inc., of Atlanta, Ga. Willis was the former exploiter of “Tanlac,” a similar alcoholic nostrum. Sargon was declared misbranded under the Federal Food and Drugs Act because of false and fraudulent claims made for it. An abstract of the government’s case against this nostrum appeared in this department of The Journal, Jan. 3, 1931. “Sargon Soft Mass Pills” seem to be a complementary treatment that goes with Sargon and are, apparently, essentially phenolphthalein. G. F. Willis, Inc., has recently filed a stipulation with the Federal Trade Commission agreeing to cease publishing false or misleading statements and specifically to cease claiming: (1) That Sargon is based upon a new or revolutionary formula ; (2) that it accomplishes its results by new and amazing methods ; (3) that it is the result of world¬wide research ; (4) that signed statements approving Sargon pour in from physicians, and various other false and misleading claims. The concern also stipulated that it would cease misstating the official, professional or educational standing of persons giving testimonials, would cease publishing testimonials that had been altered so as to change their meaning, and would also cease using testimonials that had been paid for unless the fact that they had been paid for was given publicity. 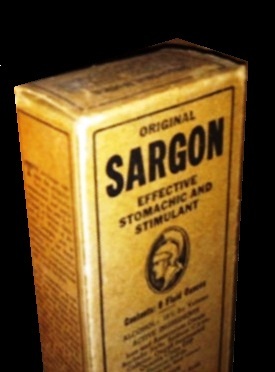 Despite the agreement to quit making false claims about Sargon, the quack medicine would remain on the market for years.